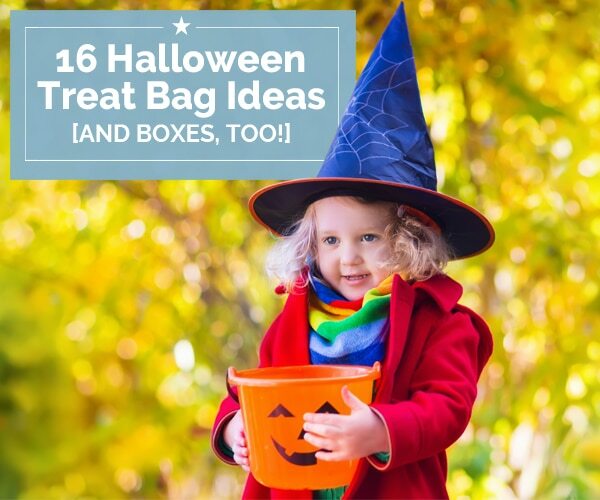 Trick-or-treating season is just around the corner, which means you’ll be needing somewhere to gather and store all those delicious treats. 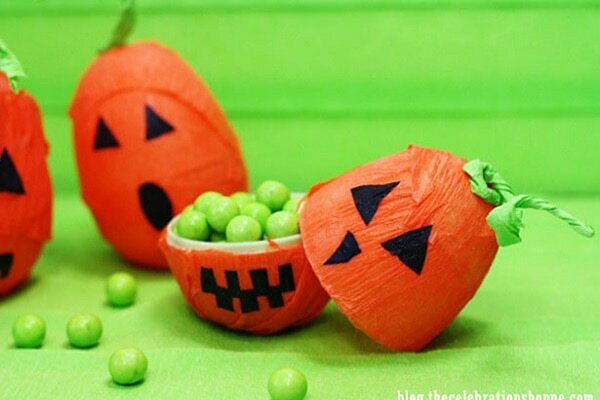 These DIY Halloween treat bag ideas run the gamut from scary to silly, and will add a touch of the handmade to Halloween festivities, whether they be roaming the neighborhood or gathering at home with friends. 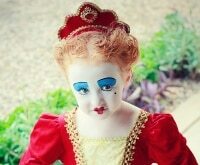 And if you need a last minute costume idea, these makeup tips and headpieces will do the trick! 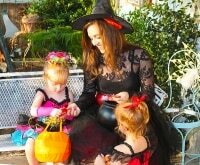 This quick and easy trick-or-treating tote is simply adorable and a great way to repurpose an old shopping bag. 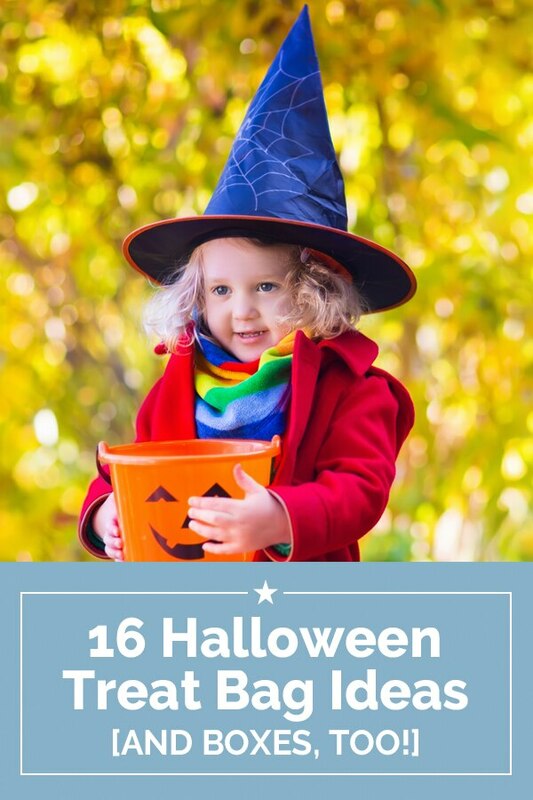 You can go with a classic pumpkin motif or pick another Halloween image (a witch’s hat, candy corn, spiderweb, you name it). On the white side of your tape paper, draw the outline of the image you’d like on your bag. 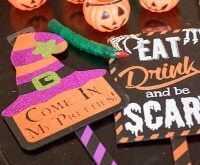 I just freehand drew a pumpkin and its stem, but you could make a simple template by printing an image outline on cardstock. Cut out roughly around the outline. Peel the orange side of the sticky paper off, and stick the shape to the correspondingly colored construction paper. Now cut through both the tape paper and construction paper right along the outline. 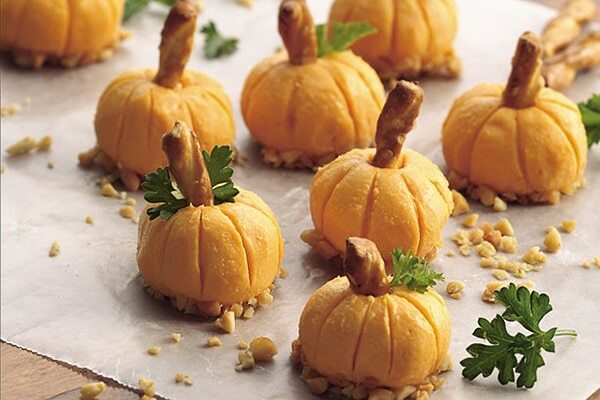 Repeat these steps for all components of your motif, in this case just the pumpkin body and the pumpkin stem. Decide where you’d like to place the shapes on the bag. 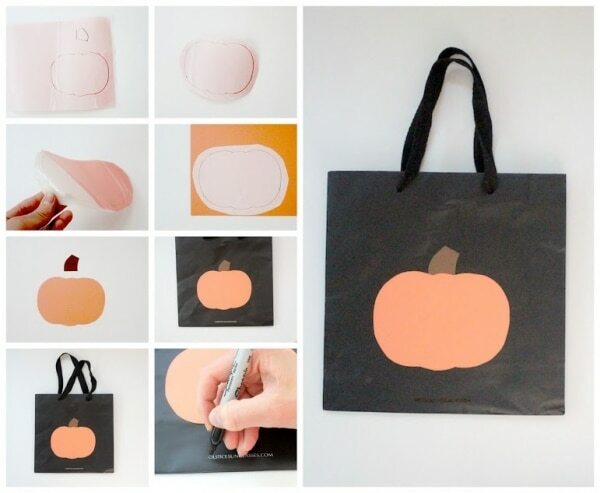 Peel off the other side of the adhesive, and stick your shapes on the bag. 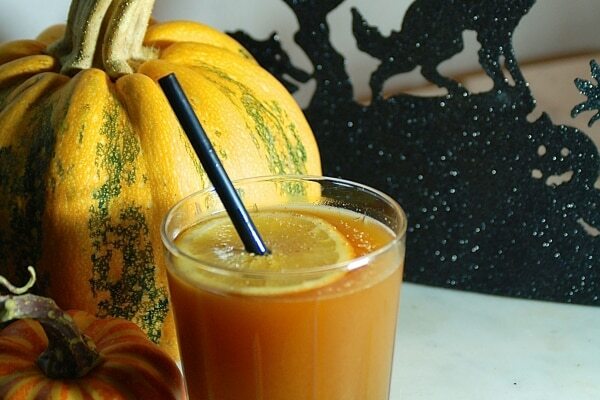 For the pumpkin, I placed the stem first so I could overlap the body on top of it a bit. If there are remaining logos on the bag you’d like to cover, use a matching Sharpie to cover them up (I covered up a white logo with a black Sharpie). 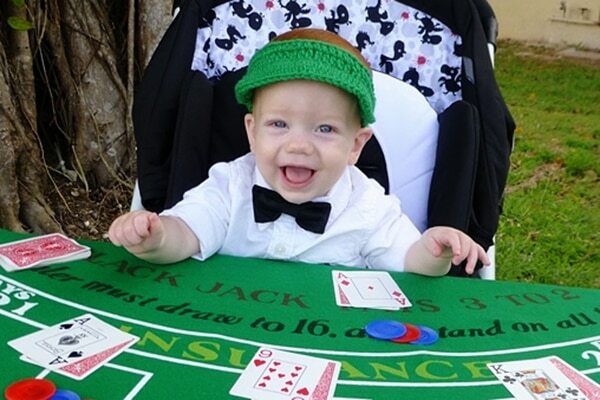 You could also use the same process to add a name label. 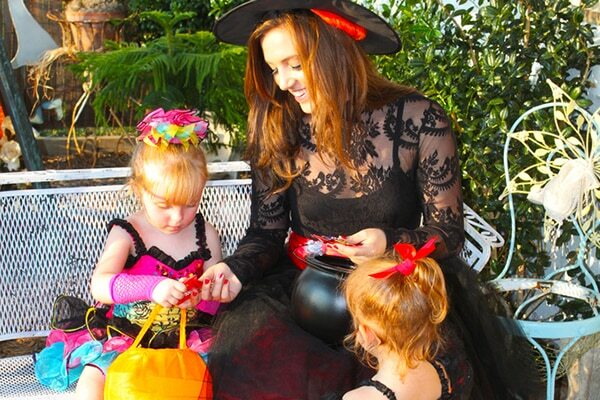 Fill your bag with candy! 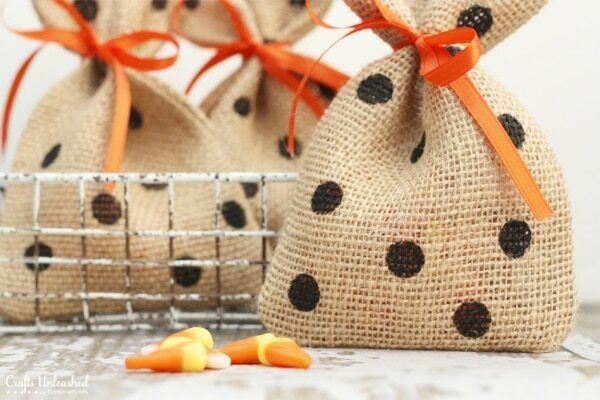 Turn plain muslin treat bags into adorable party favors with a sparkly spin on the usual spooky. 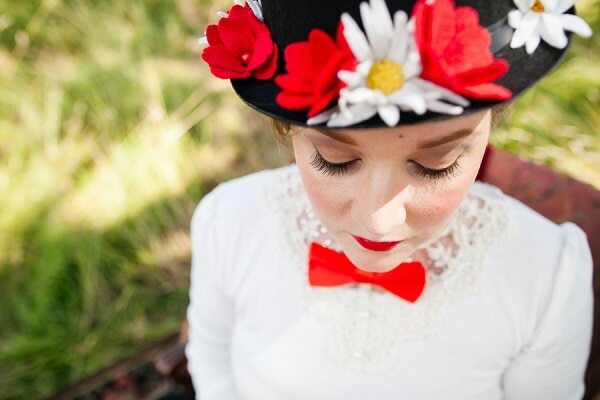 All you need is a stencil, glitter paint, and a bit of puff paint for detailing along the bottom. 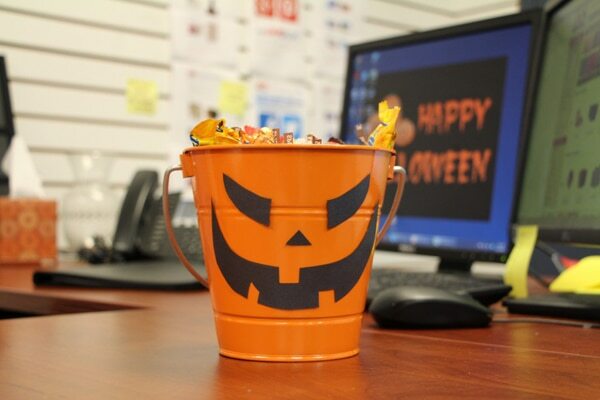 What could be more appropriate for a candy bag than a candy design? 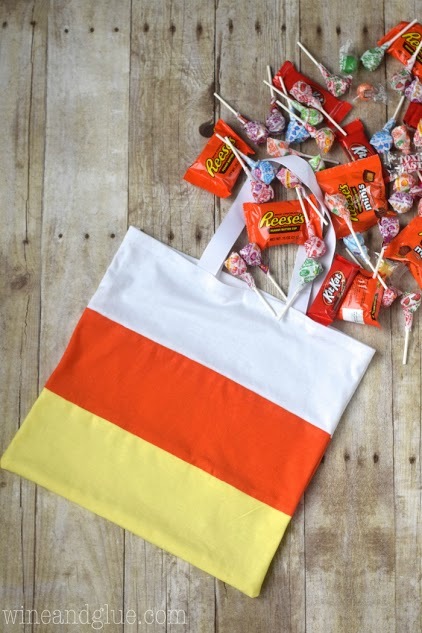 Turn Dollar Store T-shirts into a cute candy corn tote with just some basic sewing skills — you don’t even need shirts of the same size. 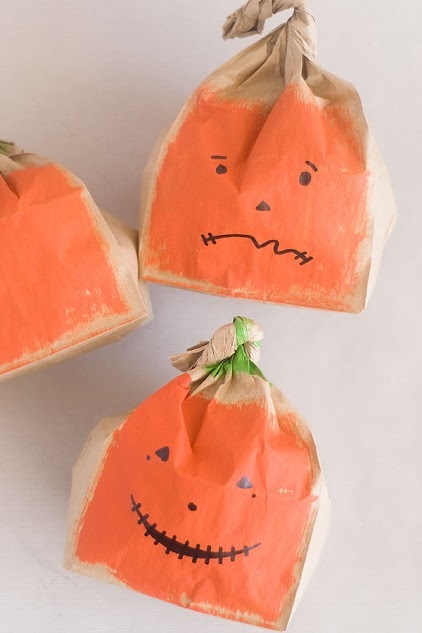 Start with a plain paper bag, add paint and permanent marker, and you’ve got an adorable jack-o’-lantern character with an appealingly handmade vibe. 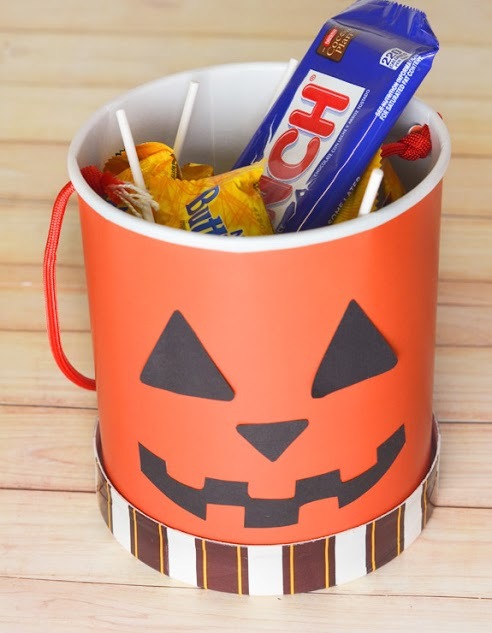 Fill with candy to give to trick-or-treaters or party guests. 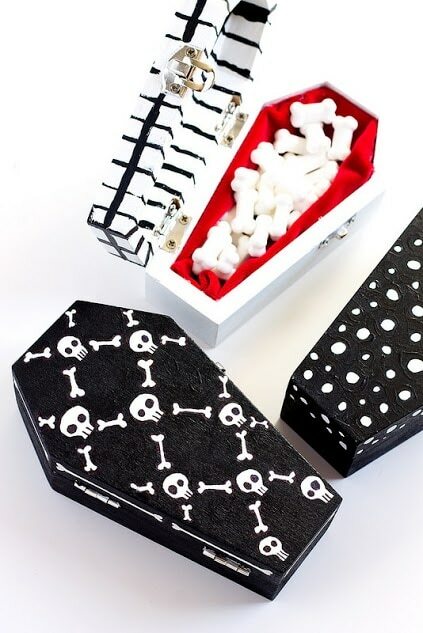 These mini craft coffins are an especially clever place to house Halloween treats. 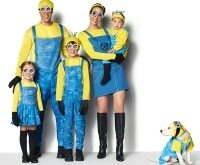 Just give them a fresh coat of paint and velvet lining, and your candy will have a spooky new home. 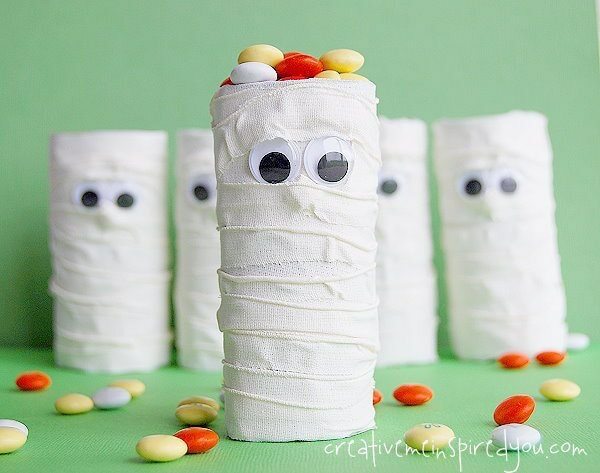 These cute and creepy mummy boxes double as a toy when empty. 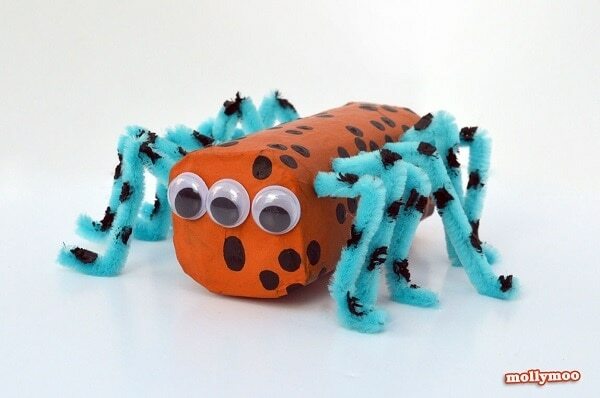 To make, simply cover a toilet paper tube with sports wrap and add googly eyes. 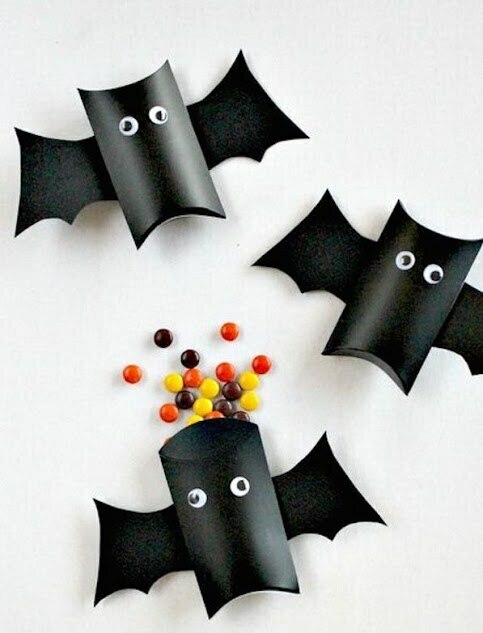 Black pillow boxes become spooky flying creatures with the addition of black cardstock wings and googly eyes. 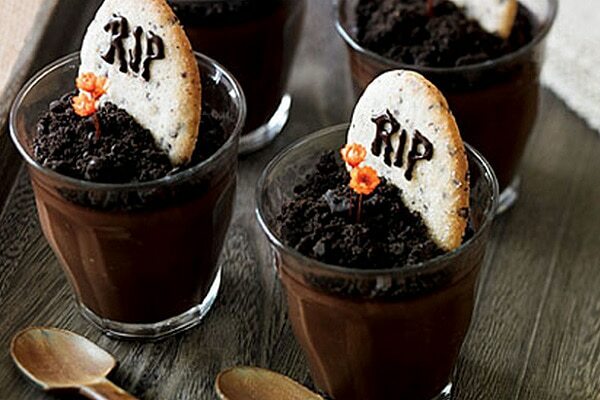 Perfect for holding snack-sized candy. 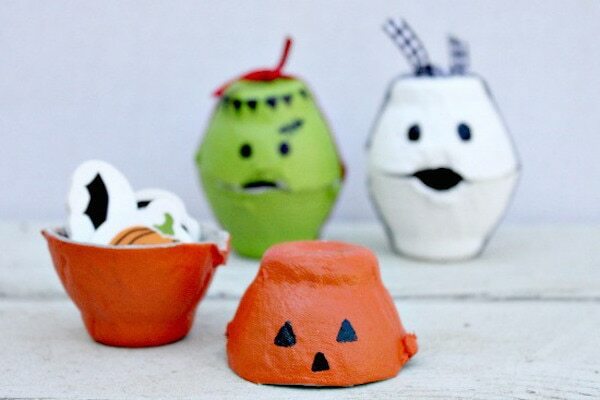 All you need to make these little characters is an egg carton, paint, and a Sharpie. 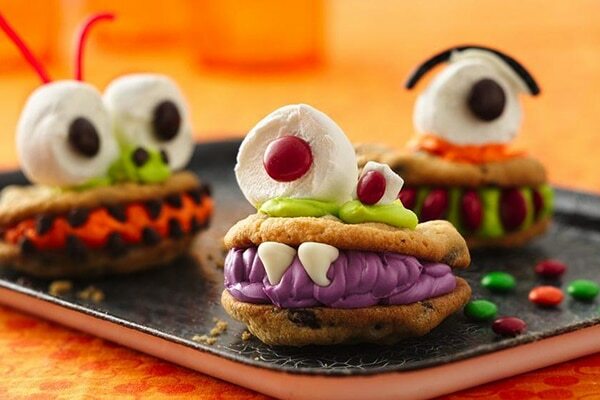 Create whatever creatures you like — pumpkins and Frankenstein to ghosts and mummies. 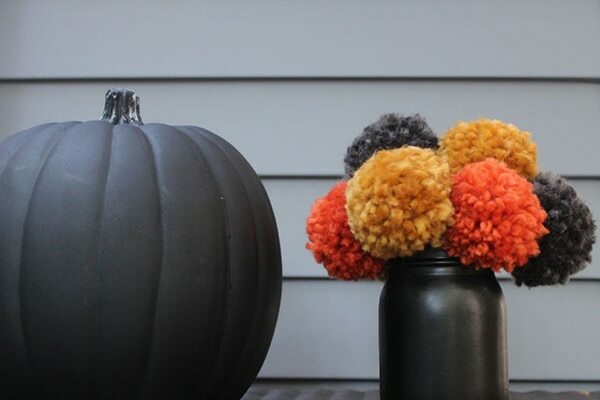 This is a great craft to do with kiddos. 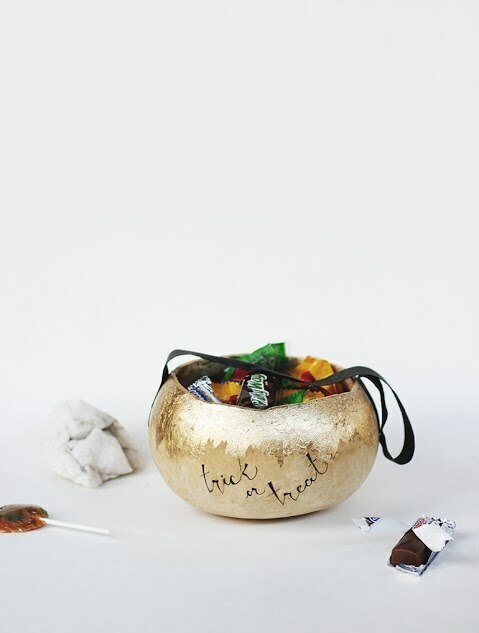 A dried gourd makes a beautifully elegant base for this trick-or-treating basket. 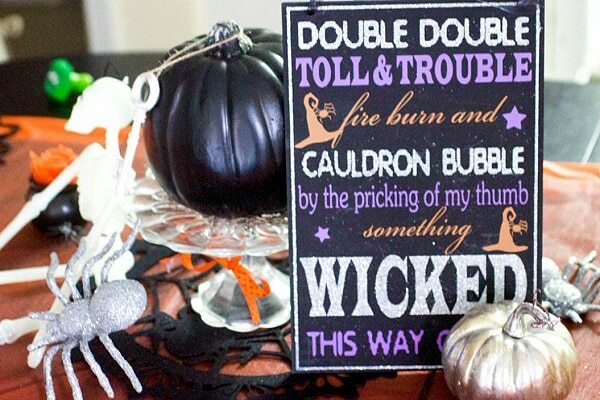 To make, you’ll saw the gourd in half, cover it with gold leaf, and add a leather strap. 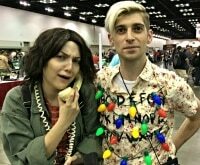 This easy upcycling project costs next to nothing. 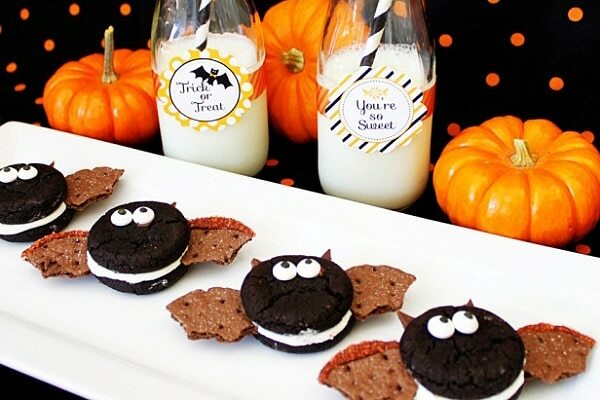 Once the ice cream is all gone, turn its carton into a trick-or-treating bucket. Simply cover with construction paper and add a string handle. 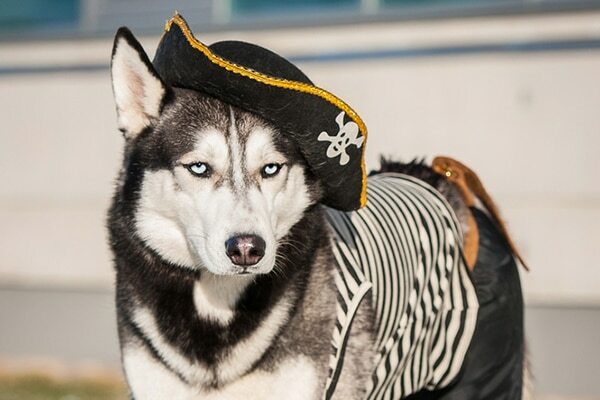 Halloween doesn’t have to be all ghosts and goblins. 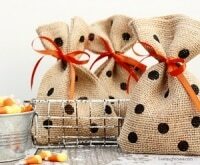 Black polka dots and orange ribbon make these muslin bags festive without the frightful. 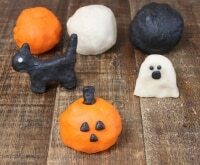 A free template makes it easy to create these modern treat bags, featuring the quintessential Halloween sentiment. 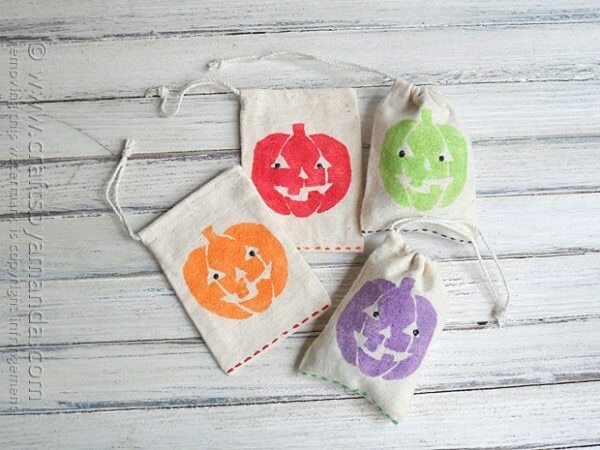 These wicked little treat bags are perfect for packaged snacks. 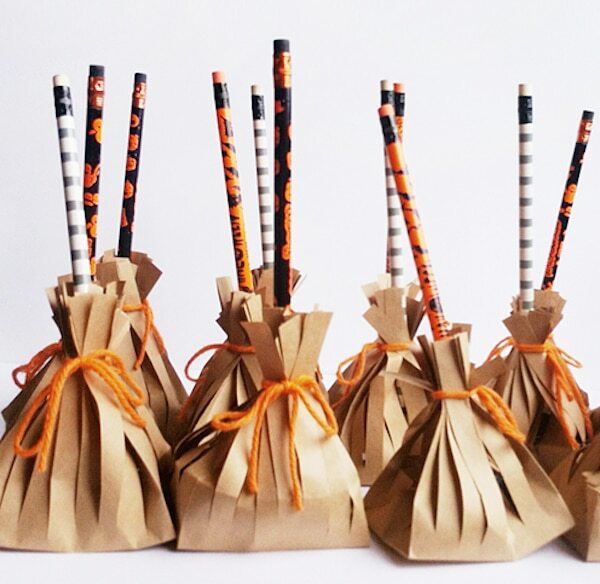 Simply cut the tops of brown paper bags into strips, then tie them around pencils. 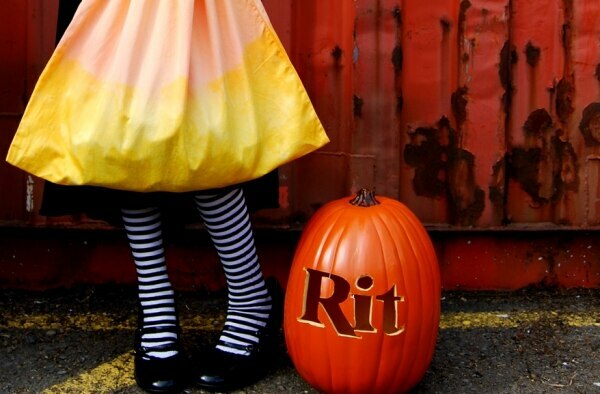 Go old school and use a pillowcase to gather candy, but make it a bit more eye-catching with yellow and orange dye. 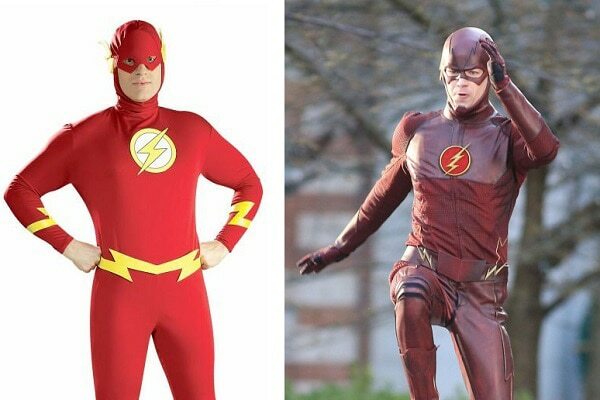 Spraying on the dye makes this an easy DIY. 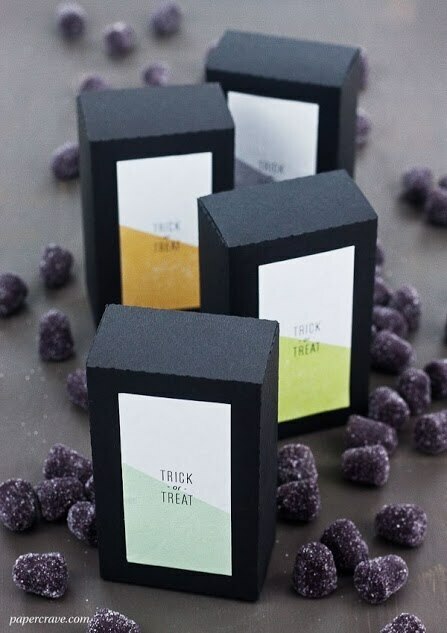 These modern and elegant treat boxes would make ideal party favors for adults and kids alike. 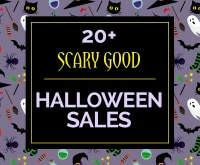 Use the free template provided for chic Halloween accessories that will stand out from the crowd. 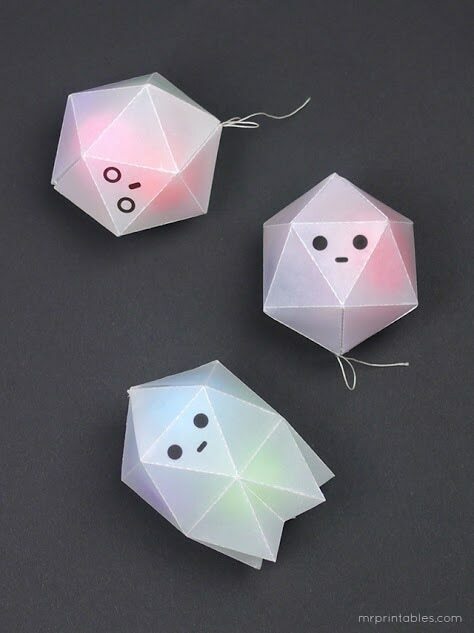 These little ghosts have eaten your candy, but fortunately you can still see what’s inside. 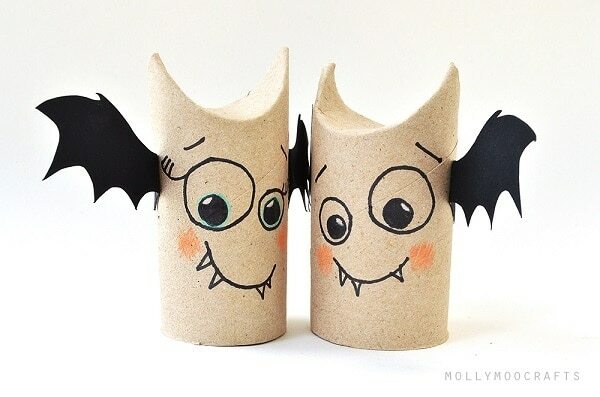 This tutorial shows you how to make wax paper, and how to fold it into haunting little shapes. 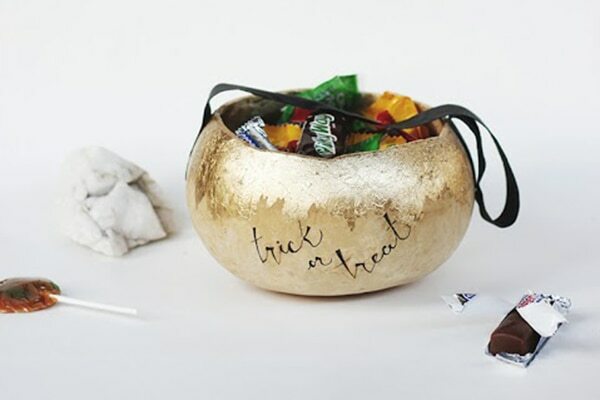 Halloween wouldn’t be the same without candy, but it’s easy to stash it and forget about it (or gorge on it all in one night). 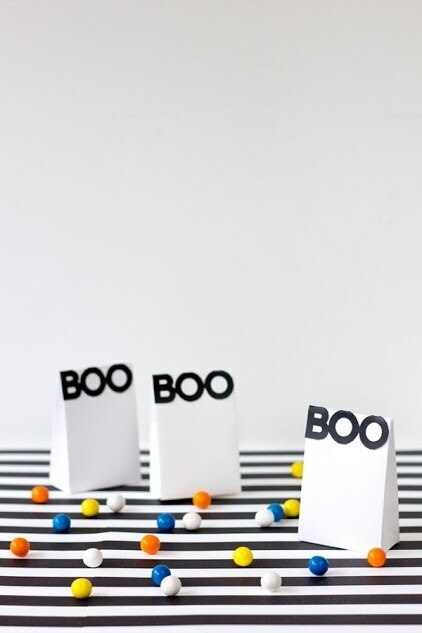 Instead, collect, display, and give it away in these adorable packaging ideas. 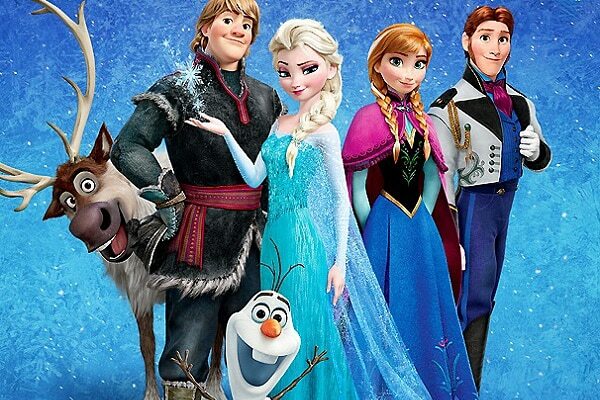 You’ll be the most popular house on the block!